What are Cynthia’s fees for mediation or arbitration? What is the process for calendaring, or scheduling a mediation? For details, please see our Mediation Scheduling page. What is Cynthia’s practice regarding mediation briefing? Sending Cynthia a hard copy of any briefing over 100 pages, including exhibits. Please see our Mediation Scheduling page for detail about scheduling the Pre-Mediation Conference Call. Does Cynthia hold joint sessions? Cynthia’s standard practice is to hold a short joint session so that she can explain the mediation process and logistics to everyone, and have all participants sign the Mediation and Confidentiality Agreement. Cynthia finds that beginning together in a respectful, non-substantive joint session provides an opportunity for all parties to start with a shared resolution vision. In some rare and unique cases, Cynthia and counsel decide together during the Pre-Mediation Conference Call that there is good reason to hold a substantive session at the beginning or at some point during the mediation, or to dispense with a joint session. How long is a mediation day? Cynthia’s goal is to resolve each case as quickly as possible, but she has learned over the years that in many cases the greatest chance of success comes when the mediation process is not rushed. Parties and attorneys on all sides need to be heard fully, and to feel fully heard. Thus, Cynthia recommends the parties plan to stay beyond business hours if that is required to reach full resolution. Cynthia always stays as long as it takes, and she encourages participants to do the same. Cynthia requests that all interested parties, stakeholders and counsel attend the mediation, including insurance representatives where at all possible. At the least, all interested parties and stakeholders should be available by telephone. If you are mediating through the Alameda County Superior Court ADR Program, please note that by local rule all named parties and a representative from any involved insurance company must attend the mediation. What amenities do you offer in your mediation space? We offer comfortable mediation space in The Ordway Building, which overlooks Lake Merritt in a pretty and convenient part of Oakland. We have a variety of conference rooms as needed to accommodate any size group. 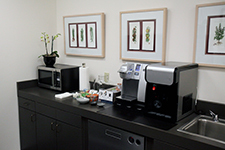 We offer lunch, coffee, tea, soft drinks, and a variety of snacks in our mediation space, and are fortunate to have additional food just steps away. The Eden Plaza Café is available for breakfast and lunch, and is in our building on the same floor as our suite. We also have two nice cafés just steps outside the building, the City Lights Café, and Specialty’s Café and Bakery. And that is just the beginning. Our surrounding area boasts many restaurants that reflect Oakland’s gourmet renaissance. How do I get to The Ordway Building and where do I park? For details, please see our Mediation Location page. I am coming to Oakland from out of town. What hotels are convenient to your office? The closest hotels to our building are only about 10 blocks away on Broadway, the Oakland Marriott City Center, 510.431.4000, and the Courtyard Oakland Downtown, 510.625.8282. San Francisco’s Embarcadero area is a quick BART ride from our offices and boasts many nice hotels. The closest hotel to BART and our offices is the Hyatt Regency San Francisco, 5 Embarcadero Center, San Francisco, CA 94111, 415.788.1234 or 888.591.1234. What are the Closest Restaurants Open at Night? The dinner restaurants within a few blocks of our building offer a nice variety of the Oakland culinary scene. Amazona’s Pizza, 2427 Telegraph Ave., 510.625.1233; DELIVERY 11:00 a.m. to 11 p.m.
What if I need general information or have questions not addressed on this website? Please feel free to contact Robert (Cynthia’s Practice Manager) at 510.452.5298 or Admin@RemmersGlobal.com. Or, you can contact Cynthia directly at 510.379.5298 or Cynthia@RemmersGlobal.com. Please note that Cynthia does not return e-mail or phone calls during mediations, so she may be delayed in getting back to you.